In one of Taylor Swift’s new singles, “Look What You Made Me Do,” the singer showcases an unexpected change in artistic style. She mocks herself in her new record-breaking music video with self-directed insults that strike an odd chord. Many took to Twitter or other social media platforms to joke about how “nobody shades Taylor like Taylor” and to praise her critical self-examination and admission of a past public persona that has been seen as disingenuous. On Reputation, we’re supposed to see a new, presumably more mature Taylor, but she seems to be more openly petty than ever. “Look What You Made Me Do” demonstrates a clear inability to take responsibility for her own actions: The title itself implies that Kim Kardashian (and, by extent, Kanye West), through revealing her lies, have forced her to alter her persona by exposing her as a “villain” rather than a good girl. She refuses, however, to acknowledge that her intentional falsehoods have led to her own demise, which has yet to be seen considering the wide attention the new track has garnered. Swift’s self-titled first album was released back in 2006, when she was only 17 years old, and featured tracks like “Invisible” and “Cold As You.” Her older tracks, like “Love Story,” were more heavily based on narrative. Swift’s most recent album, 1989, came out in 2014 and leaned more towards pop than country. She has slowly moved from tracks that tell a story to “…Ready For It?”, which is a culmination of this decline. There is no development in the song’s narrative, and its lack of development extends to its melody and overall sound. The end of the track has more components, but frankly, it’s a boring song. A change that became apparent in her first track is a move toward electronic, and perhaps even a style that could be characterized as hip-hop. Her second single confirms this recent shift, with Swift trying and failing to make her rap verses sound interesting and genuine. The only line in “Look What You Made Me Do” that is a clear reference to another celeb is “I don’t like your tilted stage,” which targets Kanye West, who performed on a tilted stage in 2016. Many have been referring to “Look What You Made Me Do” as a diss track, a type of song that’s most commonly associated with hip-hop artists such as JAY-Z, Kendrick Lamar, and Eminem. However, what has not changed is Swift’s rabid insulting of other celebs and her vague songs that ask fans to discover the deeper story. This works to keep up the intrigue. There are numerous articles with titles such as “Each and every dig that Taylor Swift makes in the Look What You Made Me Do music video” that analyze the lyrics word by word, and the video frame by frame. The line “Younger than my exes/But he act like such a man, so…” in the second single continues to insult her ex-boyfriends in a slightly more pointed way than we’ve seen from Swift in the past. She notably wrote “Forever and Always” about ex Joe Jonas, but the allusions in those lyrics were much more vague, and the link was only revealed in an interview, where she also revealed that he broke up with her in a 25-second phone call. The heavily crafted and produced songs are a deviation from her music in the past, although maybe not as unexpected as some might think. Both new singles’ pre-choruses are similar to her 1989 sound. The tune is fun and there are some light harmonies on “Look What You Made Me Do” (at least, they’re an octave up and make it a little more interesting to listen to). She brings back the familiar anger from “Better Than Revenge” and “Bad Blood”—hopefully, like with “Bad Blood,” there will be a better version of that track that features someone that actually knows how to rap. After years of defending her innocent persona and straddling the line between confident, savvy businesswoman, and an innocent small-town girl who is overly criticized by the media, she takes herself in the new direction of total villain. Threats such as “Baby, I got mine, but you’ll all get yours” vaguely refer to what is to come from Swift, although, for now, these threats seem entirely empty. Her new reputation, whatever she may be trying to craft, will most likely be a success due to her fans’ loyalty through the years. Over the course of five albums (soon to be six) and 11 years, Swift has evolved from a country, good-girl sweetheart to a powerful woman in the industry. This new shift, albeit much more sudden, will not send America’s ears away so quickly. The question remains of if she will manage to control and create her new persona as she had so skillfully done before Kardashian exposed her as a “snake” last year. Let’s just hope that “…Ready For It?” is the only time we have to hear Swift rap. Part of the fun that comes with listening to Swift’s music—her old music, at least—is the playful melodies and harmonies combined the comfy twang of her voice. Also, she can’t rap. There’s nothing we can do to get the old Taylor back, so all we can do is wait and try to get ready for it, whatever “it” may be. 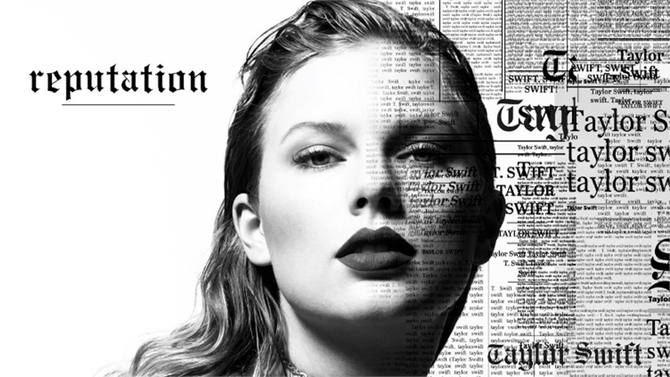 Reputation comes out in full on Nov. 10.